Traditionally, Taiyuan has had little to distinguish itself from most other Chinese cities. As the capital city of Shanxi province in the north-east, it is best known as a coal-mining economy and home to many of the industry’s wealthy owners. But recently it has entered the national spotlight. In the space of a year, Taiyuan has shifted its entire taxi fleet from petrol power to electricity. Thanks to strong support from the local government, electric vehicle (EV) sales in the city accounted for 7% of total car purchases in 2017, compared to 1% globally. What’s happening in Taiyuan serves as an important lesson for other cities as governments struggle to shift economic growth away from heavy industry towards more sustainable models of development. By reducing the number of petrol cars on the road, the city is tackling its car pollution problem while shoring up China’s position as a leader in clean technology. Taiyuan illustrates how with the right policy support, a town can deliver rapid change. But the city still has plenty of conventional cars on its roads and its experience also shows the risks of moving too quickly. In 2015, Shanxi’s coal output stalled before shrinking by 14% the following year. In need of new sources of economic growth, Taiyuan’s government began working hard to court the country’s burgeoning electric vehicle sector. In 2016, and with little fanfare, the city switched its entire taxi fleet to electric cars (excluding the private cars used by services like Didi and Uber). Chinese vehicle manufacturer BYD sold 8,292 E6 vehicles. So how did a city built on coal wealth come to have more electric taxis than any other in China? China is the world’s largest car market. Its leaders have set ambitious medium-term goals for automotive efficiency and climate change, including a cap on carbon emissions by 2030. In September 2017, they went further and announced plans to ban combustion engine cars altogether (though no timeline was announced). China began promoting EVs in 2009, initially across ten cities. However, Taiyuan was not one of them. In fact, its cold temperatures can limit the effectiveness of the lithium-ion batteries used by EVs, potentially reducing the distance vehicles can travel. Nonetheless, in March 2016 manufacturer BYD set about opening its first factory in Taiyuan. Today, six other EV makers have facilities there. And BYD alone is expected to contribute 5% of the city’s GDP. This is partly due to support from local government, which is working hard to lure carmakers. Like most of China’s city’s, Taiyuan has a public taxi fleet owned by several companies. In recent years this has been supplemented by an unofficial taxi sector, which operates in much the same way as Uber, with private drivers offering their services through a mobile application. Public taxi drivers buy their own vehicles (or lease them from companies). However, it’s the local government that decides the type of cars that can operate as public taxis through mandatory purchase requirements. The contract to buy over 8,000 BYD cars, which retail at 300,000 yuan (US$46,000) each, was a welcoming signal to the EV sector. Taiyuan’s city planners also promised to replace all public buses (some 2,650) with electric ones, which is expected to complete this year. 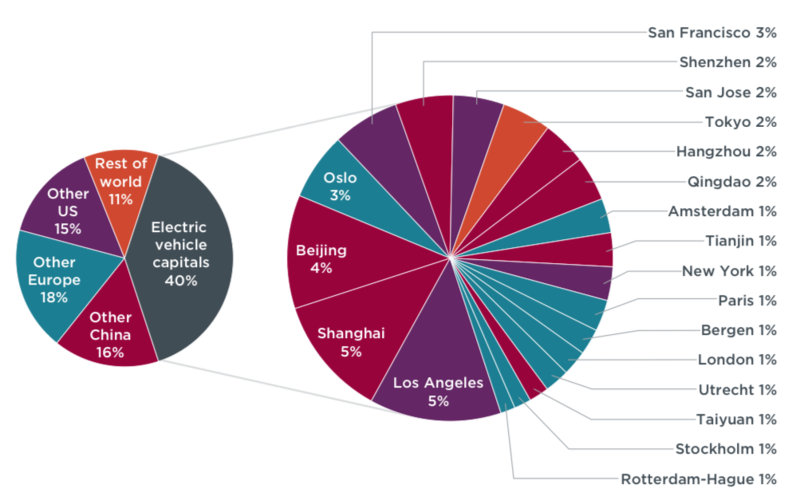 In recognition of its EV policies, Taiyuan also made the International Council on Clean Transportation’s list of 20 EV Capitals last year – a ranking of cities with the highest EV sales. Electrification of the taxi fleet meant Taiyuan accounted for 1% of electric vehicles globally as of 2016. Data and image from the ICCT’s 2017 EV Briefing. Having a local EV manufacturer has helped Taiyuan to bring electric cars online but without an overhaul of the existing infrastructure, a complete switch would have been impossible. The provision and maintenance of charging stations, and management of new grid demands are needed, too. As are public awareness campaigns that promote greater understanding around the benefits of EVs. First, the size of Taiyuan’s taxi fleet is relatively small (Beijing and Shanghai each have fleets greater than 50,000), which made planning and financing the transport upgrade simpler. Secondly, charging stations were carefully positioned on the city’s ring road, making them easier for drivers to access. “They can charge and go,” said Li Dewang, of the Taiyuan Environmental Planning Institute. Convenience is a factor. Timing was another. Taiyuan’s fleet was due to be replaced in 2016 anyway (in China, municipal governments set limits on how long fleets are allowed in operation before re-registration is needed), so taxi drivers were expecting to buy new vehicles. Finally, Taiyuan’s government had the financing and determination to offer generous consumer subsidies for EV vehicles. (Subsidies offered roughly double the provincial government rate, according to the Economic Observer, which is owned by Chinese state media site, Xinhua). In Tiayuan, drivers can buy a 300,000 yuan (US$46,000) BYD E6 for 87,500 yuan (US$14,500). “In late 2015 and early 2016 many drivers were against the change,” said Xie Hongxing, head of Clean Air Asia, an international environmental non-profit organisation. “But by March 2016 a majority who’d made the switch were happy; by June most had switched and there weren’t many objections,” he added. The city’s car owners have been less eager to embrace vehicle electrification. EVs account for 1.8% of all road vehicles in Taiyuan (20,000 EVs out of 1.15 million vehicles). Of this, almost half are designated taxis and buses. “Taiyuan’s taken the first step, but there’s a long way to go yet,” said Wu Ye. More charging stations are needed and parking garages. But more worrying is that Taiyuan’s electricity is still mostly sourced from polluting coal generation. “80% of Shanxi’s electricity comes from coal, 10% from wind, solar and hydro, and despite this, wind power is still being wasted. So the electricity system could be better managed,” so that coal power is displaced by renewables, said Zhao Yongqiang, deputy head of the Renewable Energy Centre at the National Development and Reform Commission’s Energy Research Institute. In China as a whole, coal accounted for 63% of electricity generated in 2016. But Shanxi produces one quarter of the country’s coal and its power generation relies on it far more than the national average. The plan to build and buy EVs looks to have been successful in Taiyuan. But that doesn’t mean that other cities will be able to replicate it. It is worth noting that the city’s promotion of the EV sector is closely associated with the current mayor, Geng Yanbo, who featured in the BBC documentary The Chinese Mayor. Geng is a controversial figure. As mayor of the city of Datong he embarked on wide-ranging plans to improve traffic flow and infrastructure, but was criticised for pushing through changes too quickly and destroying sites of cultural importance. As mayor of Taiyuan, Geng has rebuilt the city’s road network and as the chair of a working group promoting EVs is a strong advocate for the technology. Whilst electrification of the taxi fleet has bolstered the city’s low-carbon reputation, it does little to address the city’s worsening traffic pollution given that taxis make up only a small proportion of vehicles. Although replacing 8,000 taxis with EVs within a year is a huge feat, it is only a starting point for the broader transport reforms Taiyuan needs. And these will depend on much more than the determination and capabilities of whoever is in charge. The electrification of its taxi fleet put Taiyuan at the forefront of cities replacing their fuel-burning vehicles. On October 23, 12 cities in the C40 Cities Climate Leadership Group, including London and Paris, announced they would buy only zero-emission buses from 2025. Previously some countries, including Germany and the UK, announced plans to ban the sale of fuel-burning vehicles. China has also started looking into a timetable for doing this. But for Taiyuan to remain an EV Capital and become a real leader in promoting a shift to greener transport, this coal city needs to consider deeper reforms.